The default search behavior for your Studio Search Page is by Name, ID, or Snapizzi 9-digit code. In order for search to function properly, your CSV file must contain columns with properly formatted headers for "First Name" and "Last Name" or a "Full Name" column. 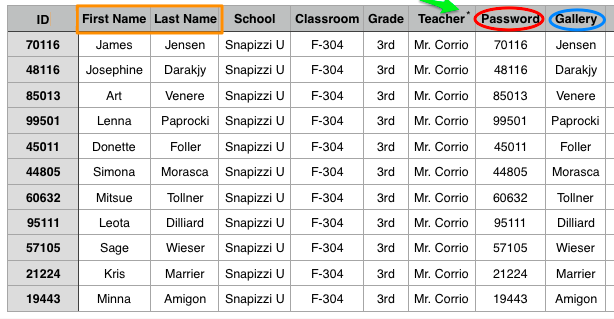 If no Full Name column exists, Snapizzi will create one from your First and Last name fields. Incorrect formatting will trigger a "Searchability" warning in the Diagnose & Remedy tool. The table below shows the other header name formats that Snapizzi will accept. Camera Cards are generated in the order listed in your CSV file. Ensure you have them in the order you would like them printed (disregard if using Paperless). Since the data fields for each Project are established by the CSV file, other than the name headers described above, you can include any additional data fields you'd like to have on your Project. When applicable, Snapizzi will automatically place group photos in their respective Subject's galleries. Adding an asterisk* to the name of the column header of your groups will automatically tell Snapizzi the column defines your groups. It isn't required, but if not done, you'll do it when mapping your CSV fields. Snapizzi will generate a code for each unique group. Simply photograph the group's code before taking the group photos. Read this for multi-group Projects (ballet schools, bands, etc. ), where a Subject is in more than one group photo. If you'd like to require customers to enter a password to view their photos, you must include a column labeled "Password" in your CSV file as well as enable passwording in the Privacy Settings. You can define the passwords however you wish, but if no values are in the password column, Snapizzi will create passwords for you. We recommend that you don't use the letter O or number 0 unless the context is clear for your customers. For example, if using last name, they know it would be the letter O. Or if using numbers, they know it would be a zero. You can easily edit passwords at any time. This is what is displayed on the remote gallery for your customer when they see their photos. The default gallery name for each Subject is the 9-digit code from their camera card. To change it, include a column on your CSV called "Gallery" and paste the Subject names in the cells. Your header name must be "Gallery" in order to work properly. Tip 1: To combine data from two separate columns into one, click here. This is useful for combining first and last name fields in order to use the Subject's full name for the remote gallery name. Tip 2: If you have data in one column and would like to create separate columns for each, click here. This is useful if you have a full name field and would like to create a first and a last name column.